Would you like the option to camp all year round whatever the weather? Or simply take the chill out of the cold early summer mornings and evenings… These attractive, efficient and lightweight wood burning bell tent stoves have been developed specifically for use in canvas bell tents and tipi’s.Having a wood burning stove in your bell tent means that you can comfortably camp in the worst winter conditions, being able to dry your clothes, prepare unlimited hot water, cook, and keep yourself and your kit warm and dry. They are extremely compact when stowed and can be supplied with either vertical or horizontal flue exits. 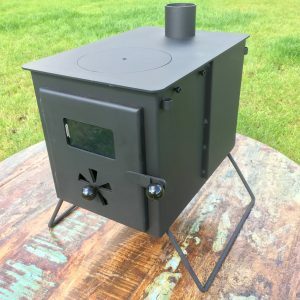 Hand made using 4mm mild steel and available in two sizes 3kw and 4kw which perfectly accommodate the 4 & 5 mtr bell tent models. 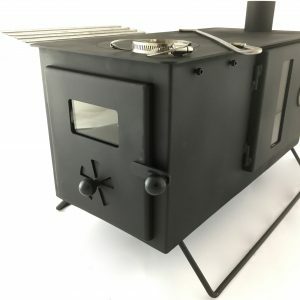 These stoves really do introduce the ultimate wow factor into your camp, not to mention the cost-affective heating and cooking they offer. 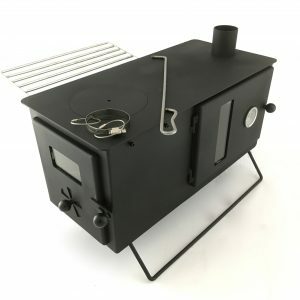 A front facing rotating vent system allows you to instantly regulate the air intake, combined with an airtight door and triple airflow, enabling the wood to be burnt with remarkable efficiency. All our flue kits are made from high grade 1mm stainless steel and are of top quality. The systems have been tested fully, meet BS Standards, and are of 2012 specification. Our flue kits can be supplied in either roof (vertical) exit, or a side wall (horizontal) exit. Please contact us if you would like to discuss these options further. In this system the flue pipe comes out of the back of the stove and though the side wall of the bell tent. For easy assembly the flue connects together using quick release locking bands and is secured at the top with guy ropes, then pegged into the ground. 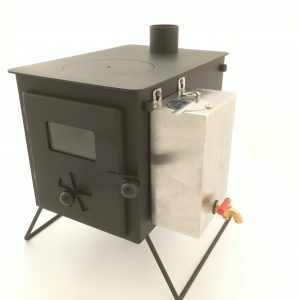 There is a flue stabiliser that you push into the ground and connect around the upright flue pipe to ensure zero movement. 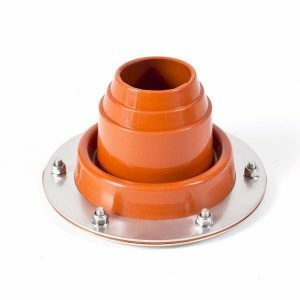 A 5″ diameter cooling sleeve is supplied that slips over the existing 4″ flue and is then seated in the silicone collar to disperse the heat evenly. This acts as a breathable barrier and ensures the silicone collar won’t perish. A spark arrestor is fitted in the witches hat (top piece of the flue) and this feature, combined with the stove baffler, ensures no hot ashes escape from the top of the flue onto the canvas. 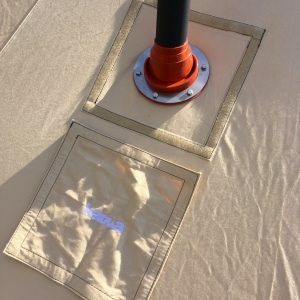 In this system the flue pipe comes out of the top of the stove and through the roof of the bell tent. Again, for easy assembly the flue connects together using quick release locking bands and is secured at the top with guy ropes, then pegged into the ground. 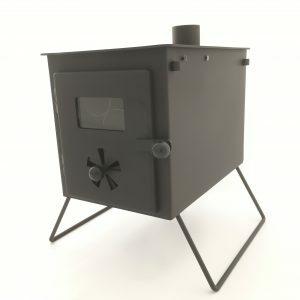 This system has an extra high and chunky 4″ flue collar on the top of the stove that serves to fully support the flue pipe. When the flue pipe is then seated in the silicone collar, in the roof, the entire configuration has maximum stability. A spark arrestor is fitted in the witches hat (top piece of the flue) and this feature, combined with the stove baffler, ensures no hot ashes escape from the top of the flue onto the canvas. We can supply flue kits separately, please contact us for details. Karma Canvas Ltd take no responsibility for the misuse of this product or for any damage caused by using it. Tents supplied by us are not pre-fireproofed so if you feel that is necessary make sure you do it yourself. We recommend that you always put a large mat under your stove to protect the groundsheet from stray sparks. Always have adequate means of putting out a fire within easy reach. All precaution should be taken when using this product, Karma Canvas Ltd cannot be held responsible for any accidents.